Schikluna's shipyard contributed about $200 million to the Canadian economy during its lifetime. A plaque in St Catherines, near the Welland Canal in Canada commemorates Louis Shickluna. It reads: A prominent Canadian shipbuilder, Shickluna was born in Malta, where he worked before emigrating to North America. By 1835 he was engaged in ship construction in Yorktown, New York. Three years later, attracted by the traffic stimulated by the Welland Canal's competition in 1833, he purchased a shipyard on the canal at St Catherines. Shickluna steadily expanded his operations, which contributed significantly to the commercial prosperity of the region. Between 1838 and 1880 he directed the construction of over 140 schooners, barkentines, steamers and other vessels designed primarily for service on the Great Lakes, thereby promoting the development of inland navigation in Canada. Following Shickluna's death, his son Joseph continued to operate the St Catherines shipyard until 1892. Louis Scicluna was born in Senglea on June 16, 1808, son of Joseph and Therese née Farrugia, both of Senglea. He did not show any academic inclination, causing his parents concern. His father, a dockyard worker, persisted in taking his son to the dockyards hoping to pass on to him the shipwright trade. The plan worked perfectly. Aged 16, he took passage on a British ship and reached New York City circa 1825. New York was not the sort of place he had in mind and so moved on to Canada. 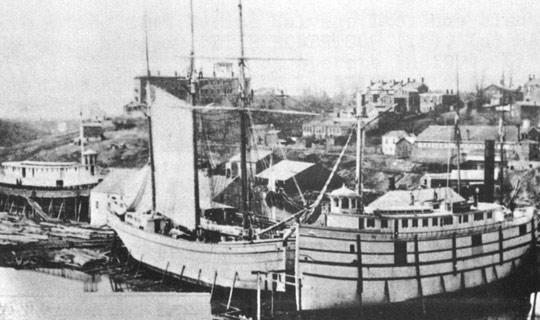 The young shipwright settled in St Catherines, near the Welland Canal. For easier pronunciation he was advised to change his surname to Shickluna. Mr Shickluna dedicated most of his time studying and examining seacraft that operated in the region while he managed to socialise with the local maritime community. In 1836, when he had absorbed enough information on the subject, he established a shipbuilding yard close to the Welland Canal. He was astute enough to anticipate that the area would become a hub of shipping activity while St Catherines turned out to be a major centre for flour-milling. Close to Mr Shickluna's shipbuilding yard, a man-made waterway was taking shape to allow vessels to bypass the Niagra Falls, making it a major link in the Great Lakes. The Welland Canal connects Lake Erie with Lake Ontario on the northern shore above which stands Toronto. Owing to the 96-metre difference between the levels of Lakes Erie and Ontario, eight stepped locks were constructed to bridge the gap, a comparable concept adopted in the Panama Canal. His yard was awarded substantial orders to build vessels of various types and tonnage despite fierce competition. The fact that Mr Shickluna was illiterate meant that he kept no record of the work done at his premises, hence it is very difficult to determine with precision all the launchings. Mr Shickluna's shipyard produced high-quality hulls lasting longer than the ones produced by his competitors. Mr Shickluna's shipbuilding yard prospered and contributed immensely to the region's economy. He employed 300 men, or 15 per cent of the entire working population of St Catherines. This kind-hearted Senglean also engaged a number of runaway slaves from America. He died aged 70 on November 24, 1880. Louis Shickluna is recognised in the maritime history of Canada and his name is included in the authoritative Dictionary of Canadian Biography.